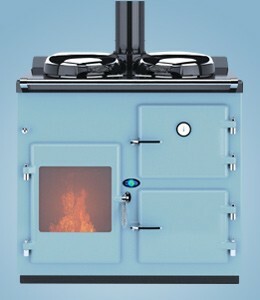 Wood Fired 2-Oven Thornhill ECO Boiler/Cooker £6,850 Inc. VAT. Dimensions: 1,000mm wide, 910mm high and 710mm deep. We are proud to have developed our new design of wood fired boiler cooker here at our premises in Canterbury. Our T3 wood burning technology system and other technical innovations have enabled us to produce one of the cleanest burning boiler-cookers in the world– good news for your wallet and the environment! To find out more about Thornhill Turbo Technology (T3), and 90% efficient DEFRA clean burning wood stoves, visit Burley Appliances by clicking here. These stoves, designed by Graham Thornhill of Thornhill Range Cookers, are some of the cleanest burning stoves in the world and are cleaner than many catalytic stoves. The Thornhill Range wood fired boiler cooker gives you two spacious ovens and two large hobs – ample for most cooking requirements. The wood-fired boiler on the left hand side sits behind a large double glazed oven door so that you can watch the flames and benefit from the ambience of a beautiful log stove in your kitchen. The oven is easily controlled by diverting the heat from the boiler using a baffle system, which means your cooker heats up in very little time. The Thornhill Range Wood Fired 2-Oven Boiler Cooker costs just £6,850 including VAT, delivery to your kitchen and connection to a suitable chimney. The Thornhill Range 2-Oven Boiler Cooker is 1,000mm wide, 910mm high and 740mm deep.